Miss call for cancellation of EVM Polling. 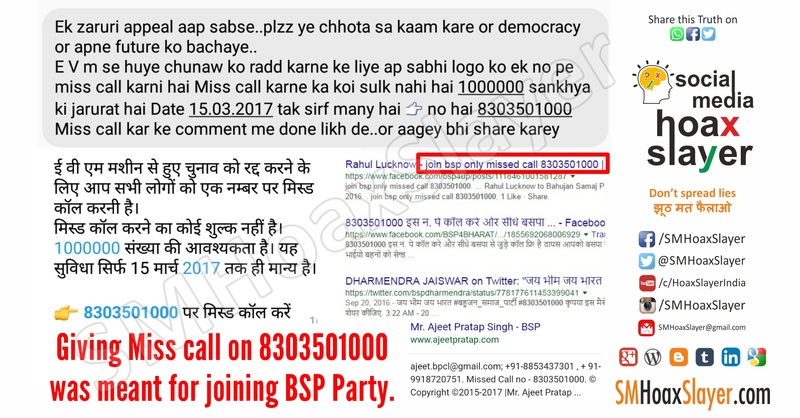 A message is viral om whatsapp etc asking to give a miss call on number 8303501000 to cancel the elections using EVM. This might be just a petition plus they may have changed the purpose. This number belongs to Bahujan samajwadi Party I.e. BSP. So this seems to be an initiative by them. This was used earlier to join BSP Party. So you never know, you might end up joining BSP LOL. ← क्या पांच राज्यों मे चुनाव वापस होंगे ? What’s that on kids’ T-shirt ? A video from Bangladesh is viral as violence in India as voting results. January 11, 2019 Amandeep Comments Off on A video from Bangladesh is viral as violence in India as voting results.